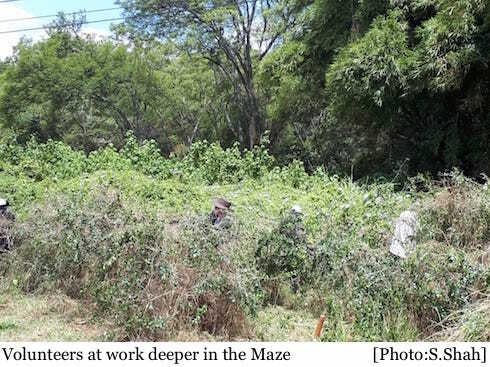 On Wednesday 20th February, members of Kenya Horticultural Society (KHS) undertook a very different monthly activity, by assembling at City Park to assist with rehabilitation of the Kei Apple maze. 6 eager members of KHS, were joined by county staff and Friends of City Park, to form a group of 20 volunteers. Katy Barnes of KHS advised the approach to be taken as cutting the creepers that had grown over the maze and pulling out the grass from within the maze. While the work was physically exerting, members found it exhilarating in different ways. One member said “it’s a strangely therapeutic activity—it’s like working on an art piece… you’re working away, and suddenly you can see the form of the piece…” Another member commented that it’s a sure way to overcome stress or anger! The volunteers worked solidly for just under 2 hours, making significant progress on the inner ring and part of the outer ring. We are very grateful to the members from KHS for taking their valuable time towards this initiative and providing the technical input on how to begin the rehabilitation. This was definitely a step towards rehabilitation, but additional time and resources will be needed to make the maze useable again. The City Park Supervisor is hopeful she can commit some manpower to continuing the work. 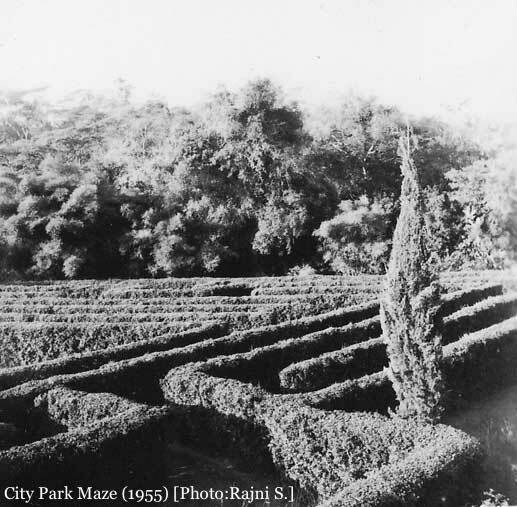 The maze or “Mtego wa panya” at City Park is one of the most iconic features, and is fondly remembered as a ‘must do adventure’ for anyone visiting Nairobi. Sadly, the maze has fallen into neglect, partly as a result of water draining directly into the maze and flooding it. Friends of City Park were successful in having 1.5 acres of the maze and adjacent greens declared a National Monument of historical interest, on 2nd December 2016, via Gazette Notice No. 9973 under the National Museums and Heritage Act No. 6 of 2006.